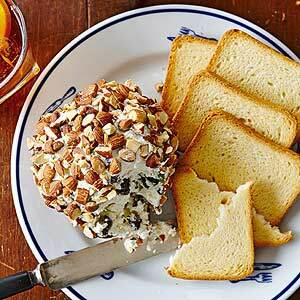 Make these cheese balls up to three months ahead of time then freeze. Thaw frozen cheese balls overnight in fridge before serving. In a large bowl, place cream cheese, butter and blue cheese; let stand 30 minutes to reach room temperature. With an electric mixer, beat mixture on low speed until smooth. Stir in olives and green onion. Cover and chill for at least 4 hours or up to 24 hours. Shape mixture into 2 balls; cover and chill until serving time. (Or, place in a freezer container and freeze up to 3 months. Let thaw in refrigerator overnight before serving.) To serve, roll in nuts. Let stand for 15 minutes. Serve with assorted crackers or apple or pear slices.